When a geographer looks at a topographic map they see it in 3D. How do they do that? Basically by being able to read contour lines and draw cross sections in their mind. To do this we need to firstly know how to draw a cross-section to see the landscape in 3D. 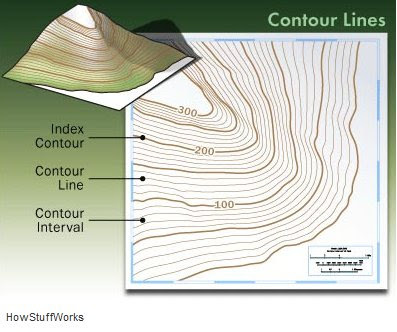 this very useful site for contours and cross sections (and other topographic map skills). Have a go at the exercises. another useful site to look at on topographic map skills.